Whether it’s telecommunications, medical imaging or cancer research, the vital technologies of today are reliant on the science of light: optics and photonics; and yet there’s a serious shortage of experts with the appropriate skills to work in these areas. Consequently, there is a push to find passionate students of STEM, and to encourage them to take up careers in optics and photonics. But doing so is not just about filling a void. Optics technicians can make a real difference. They are at the forefront of innovation and design in many areas such as medicine, national security, manufacturing and renewable energy. 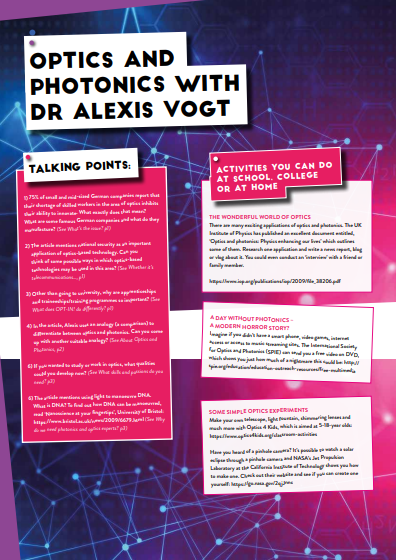 In recognition of the wonderful opportunities available in optics and photonics, Dr Alexis Vogt of Monroe Community College (MCC) created ‘OPT-IN!’ – a programme designed to strengthen the optics and photonics workforce to fill high-skilled, high-demand positions, and provide students with employment opportunities in regional industries. WHAT DOES OPT-IN! DO DIFFERENTLY? The shortage of optics and photonics experts has lot to do with the lack of suitable education and training programmes. While MCC had been running a two-year degree programme in optics since 1971, Alexis wanted to boost the intake of students into the programme with an updated curriculum, a variety of course delivery models and state-of-the-art laboratory resources. 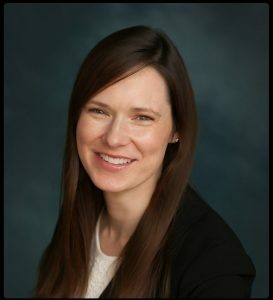 She also wanted to provide professional development, strengthen industry partnerships and broaden community awareness of educational and employment opportunities in the fields of optics and photonics. The OPT-IN! programme aims to connect more high school and college students with industry – and to produce the skilled workforce needed to keep up with demands. Another noteworthy difference is that OPT-IN! offers internships and expands outreach efforts to underrepresented populations in the industry, including women and minority groups. HOW DOES OPT-IN! SUPPORT STUDENTS FROM UNDERREPRESENTED GROUPS? OPT-IN! has several recruitment, retention and outreach initiatives to build awareness of the programme, including the development of a portable Optics Road Show and other public presentations. Presentations have been developed for both general audiences and audiences from historically underrepresented populations such as women, African Americans, Latinos, and those from low income backgrounds. WHAT HAS OPT-IN! ALREADY ACHIEVED? As a testament to the effectiveness of OPT- IN! and its recruitment strategies, 17 students graduated from MCC’s optics programme in May 2018. That is, in fact, a 325% increase from May 2016 – before OPT-IN! was set up. Another notable aspect of OPT-IN! is the partnerships it has fostered with local high schools. Interestingly, OPT-IN! has helped teachers to start teaching MCC optics courses in high schools. Students who successfully complete the school-based course receive official MCC credit. Nine high schools are currently participating in the programme and over 200 high school students are enrolled. This is an increase of 260% from 2013. WHAT ARE GRADUATES SAYING ABOUT OPT-IN!? “Hello Professor Vogt. I am happy to say I got the job with OptiPro. I will be an Advanced Process Development Lab Technician. I start on July 9th. I really appreciate everything you taught me and the position you put me in to succeed was great. Hope to see you around in the future in the well-knit optics community!” Justin Arrajj, working at OptiPro. “Professor Vogt, the end of the semester came fast, and I did not get a chance to properly thank you for all your help, support, guidance and knowledge shared throughout my time in the optics program. I truly believe the time spent in the program was well worth it and that it was the push I needed in the right direction for my future. As a job update, I did accept a full-time position at RPO as an Optical Technician.” Salaahuddin Karim, working at RPO. “Hi Professor Vogt. I just wanted to thank you for all you did during my time at MCC. Your passion for optics helped develop my own personal interest in the field and I’m proud to say that I just got accepted into the University of Arizona to continue my education!” Umut Kocak received a two-year Associate Degree in Optics from MCC and then transferred to the University of Arizona to complete his four-year Bachelor of Science in Optics. Clearly, OPT-IN! is making a difference – creating an effective pipeline between high schools, colleges and the optics industry. And, with more graduates entering this rapidly growing and diversifying industry, the programme’s future accomplishments will have a global impact. 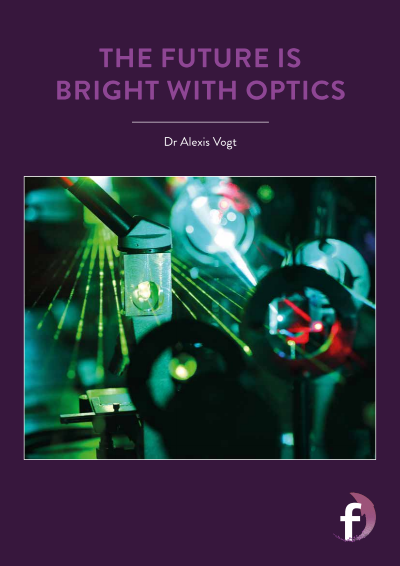 As Alexis reiterates, “Optics and photonics is one of the most amazing careers in the world and not enough people know it exists as a discipline of study!” She is doing as much as she can to change that. FIELD OF RESEARCH: Optics and its various real-world applications. RESEARCH PROJECT: OPT-IN! aims to connect more high school and college students to career opportunities in the field of photonics and optics, thus addressing the shortage of professionals in associated industries. This published material is based upon work supported by the National Science Foundation under Grant No. 1700617. At a young age I said I wanted to be a kindergarten teacher. Apparently, I had the teaching part right, but the subject matter wrong. Instead of teaching students the fundamentals of reading, I’m teaching students how to read highly technical read-outs and data! WHO OR WHAT INSPIRED YOU TO FOLLOW A CAREER IN OPTICS AND PHOTONICS? The origin of my career in optics can be traced to my freshman year at the University of Rochester. Heeding the advice of friends who spoke highly of a professor who taught an introductory course in optics, I signed up for his class. I took the Intro to Optics course and the professor, Turan Erdogan, was fantastic. His ability to distil and convey complex optics principles in a compelling and engaging way was remarkable. He’s a brilliant leader, accomplished businessman, family-focused and faith-filled man; he has inspired and motivated me since my optics career began. WHICH SUBJECTS DID YOU STUDY AT UNIVERSITY? My undergraduate degree is in optics from the Institute of Optics at the University of Rochester. I also completed my PhD in optics at the University of Rochester. COME TO MONROE COMMUNITY COLLEGE AND JOIN OUR OPTICS PROGRAMME! Optics is the field of science and engineering that deals with the origin, movement and detection of light. As for photonics, it’s a term to describe the application of optics to perform functions that traditionally fall within the domain of electronics, such as telecommunications and information processing. To illustrate the difference between the two, imagine you’re buying vegetables at a grocery store. You can buy just broccoli, or you can buy an entire assortment of vegetables – broccoli, corn, spinach, peas, squash and so on. The field of photonics could be likened to the broccoli, while all the vegetables collectively represent optics. In other words, photonics is a branch of optics. WHY DO WE NEED PHOTONICS AND OPTICS EXPERTS? Light is used in devices such as computers, smartphones and medical instruments. It can make these faster, smaller and more energy efficient. Wouldn’t we all want our devices faster, smaller and more energy efficient? Light can even be used to manoeuvre DNA and other types of nanoparticles to research cures for cancer. So, we need to get the word out that optics and photonics is an exciting and productive career path. WHAT DOES AN OPTICS AND PHOTONICS TECHNICIAN DO? An optics and photonics technician works with scientists and engineers in research, development, design, manufacturing and quality control. Optics and photonics technicians hold the critical roles of manufacturing optics and performing testing and evaluation of optical components and systems. Optics companies cannot ship products out their doors without optics and photonics technicians. 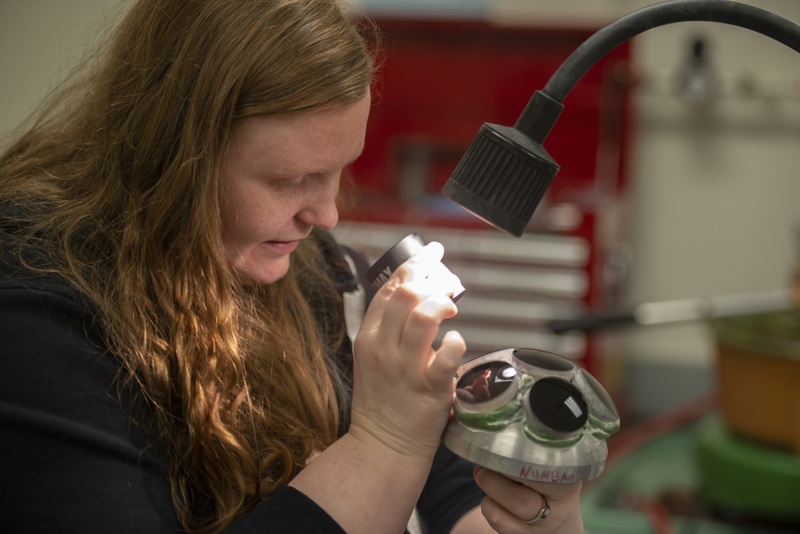 WHAT SKILLS AND PASSIONS DO YOU NEED TO BE AN OPTICS AND PHOTONICS TECHNICIAN? Optics and photonics technicians work extensively with their hands to manufacture and measure optical components and systems. Research has shown that musicians, gamers, chefs, artists and mechanics make excellent optics and photonics technicians because of their demonstrated hand-eye coordination. WHAT OTHER CAREER OPPORTUNITIES ARE THERE IN THIS FIELD? 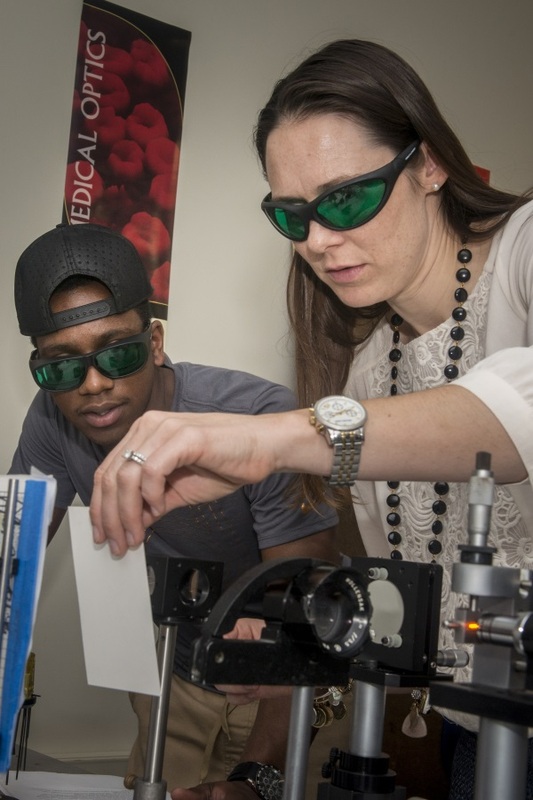 Other graduates spend two years at MCC and then transfer to a four-year university for two additional years to pursue a Bachelor of Science in Optics or Imaging Science. WHAT’S SO GREAT ABOUT WORKING IN OPTICS AND PHOTONICS? Working in optics and photonics means you are working with cutting-edge technology that enhances people’s lives.